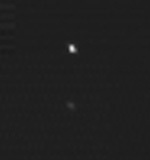 Asteroid 2002 JF56, through the eyes of New Horizons' Ralph imager. Click on the photo for a larger image and caption. It's a small object with big news for the New Horizons team: the first spacecraft to Pluto tested its tracking and imaging capabilities this week on asteroid 2002 JF56, a relatively tiny space rock orbiting in the asteroid belt. In photos snapped by the Multispectral Visible Imaging Camera (MVIC) component of New Horizons' Ralph imager, from distances ranging from 1.34 to 3.36 million kilometers (about 833,000 to 2.1 million miles), the asteroid (with an estimated diameter of about 2.5 kilometers) appears as a bright, barely resolved pinpoint of light against the background of space. That Ralph "saw" the asteroid demonstrates that it can track and photograph objects moving relative to New Horizons - just as Jupiter and its moons and then, later, Pluto and its moons will be. This capability is critical as New Horizons closes in on Jupiter for a gravity boost toward the Pluto system. "The asteroid observation was a flight test, a chance for us to test the spacecraft's ability to track a rapidly moving object and to refine our sequencing process," says Gabe Rogers, New Horizons guidance and control engineer from the Johns Hopkins University Applied Physics Laboratory, Laurel, Md. "The objects we will observe this winter in the Jupiter system will appear to be moving across the sky much more slowly than this asteroid, so these observations were an unexpected opportunity to prepare for the even faster tracking rates we'll experience in summer 2015, when the spacecraft zips through the Pluto system at more than 31,000 miles per hour." Ralph's camera took separate images on June 11, June 12 and June 13. The images had to be compressed (to save on the number of bits that must be sent back), radioed back to Earth through NASA's Deep Space Network of antenna stations, and checked out by mission team members before they could be evaluated. About an hour before closest approach to the asteroid, which occurred at 4:05 UTC on June 13, at distance of about 102,000 kilometers (as determined by the navigation team at KinetX, Inc.), Ralph began scanning it to obtain color images and infrared spectra. Those data must also be compressed before they're sent back to Earth next week. "Ralph has performed flawlessly since the launch of New Horizons and these asteroid observations are giving us more insight into the ultimate sensitivity and capability of the instrument," says Ralph Instrument Scientist Dennis Reuter, of NASA Goddard Space Flight Center, Greenbelt, Md. "They are allowing us to use Ralph to view and track a single fast-moving object as it changes from a dim speck of light in a bright star field to a body whose brightness rivals that of Jupiter at the high resolution that Ralph is capable of." Launched last Jan. 19, New Horizons is currently 283 million kilometers (176 million miles) from Earth, moving about the Sun at about 27 kilometers (17 miles) per second. The spacecraft is on course to fly through the Jupiter system for science studies and a gravity assist, with closest approach to the giant planet set for Feb. 28, 2007.